You might not believe it, but some people are still not into programs and applications to listen to music via streaming such as Spotify, Apple Music and Co. Some people still prefer to download songs in MP3 to load them onto their smartphones or music players or simply because they need the files to be able to work on them on their audio stations. And the truth is that there are quite a few alternatives to download music. For instance, YouTube has become an almost inexhaustible source, with millions of songs and thousands of applications for PC or Android, such as Peggo (with an APK version), aTube Catcher or TubeMate that can download songs from the video streaming platform. However, there's a problem with the latter: the maximum audio quality is 256kbps. So, if you want to get the maximum quality possible offered by the MP3 format (320kbps) you'll have to use other systems that are becoming harder and harder to find. However, Music MP3 Downloader is a great alternative. This program brings together the download of music files with the concept of webs like Last.fm so it works similarly to a social network. Thus, the user can locate those songs he's interested in in a more intuitive manner, based on his own musical tastes and criteria. In any case, if you've ever used apps of the likes of Songr, you'll know what it's all about: just input the name of the song, artist or album and browse through the results. 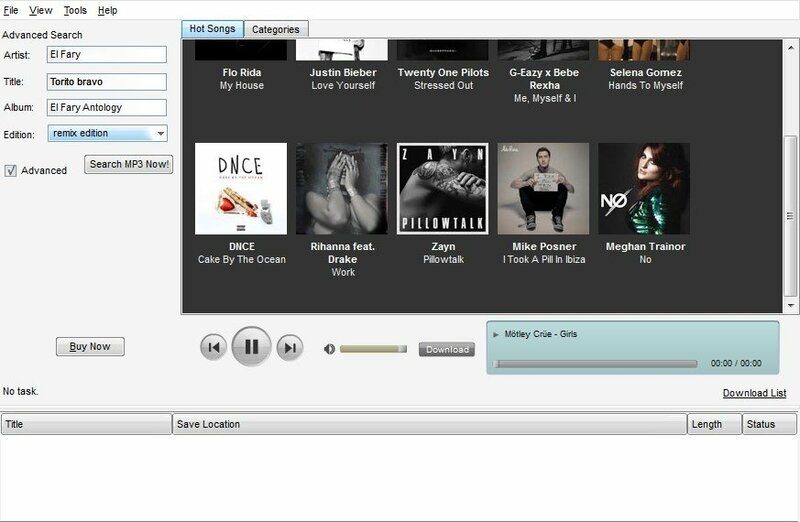 By the way, the program's interface will probably remind you of previous versions of iTunes. An efficient application to download music in MP3 format. Integrated search engine for songs. 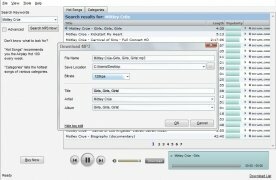 Possibility to choose the bitrate of each song. In any case, with Music MP3 Downloader you don't necessarily need to download the music because it comes along with a media player on the application's interface, so that you can listen to a song before deciding to download it. This is a trial version that allows us to download 5 full songs. After that, you can download 50% of the song.